This just in: Donald Trump’s TV-binging habits are here to stay. Not only did the New York Times write a whole feature detailing his daily television watching schedule, which includes three hours every morning plus several more hours in the evening, but his aides have been complaining that he won’t stop turning on cable news and obsessing over what people think about him, a claim that seems to be corroborated by his constant whining to the press, who he hates, about what other people (politicians, journalists, celebrities, random folks on Twitter, etc.) are saying about him. Now, CNN inadvertently captured an example of the Jolly Orange Giant’s obsession when they cut to him riding Air Force One only to discover that, instead of doing his job, he was blabbing to reporters about how “really beautiful” and “great” the airplane was while a television set blared commercials in the background at a near-deafening volume. That’s right. The 70-year-old leader of the free word (cringe) couldn’t even turn it off (or down) for five minutes to talk to reporters. Watch the painfully awkward clip below. And, remember, call 800-588-2300 Empire today. President Crybaby loves the tee vee. How dare he watch TV. He should be on the golf course. Fact free conservatives. Obama didn’t come close to golfing presidents like Wilson or Eisenhower, and sure in the hell wasn’t golfing when warned of an imminent terrorist attack like your fave W. Bush. In fact, Barack Obama can’t match America’s most frequent golfing presidents, and vacationed less than his predecessors too. That means Bannon and Pence and Miller and the others are in charge. Not good at all! Soon, he will have that experience when he’s breaking rocks at Leavenworth Federal Penitentiary. Thank our lucky stars he’s not a Nielsen family! Can we please get serious? I despise Trump, but who the hell cares if he’s watching TV while he’s flying somewhere in an airplane? Resist what he wants to do, and call him out for what he does, but don’t talk about him when he’s not doing anything. We have to hear about him more than enough as it is. He’s mainlining Fox News, that’s why it matters. He’s tweeting crap straight off Fox’s shows and focused on nonsense like crowd-size comparisons rather than the multiple challenges facing the US, in part because of him. @Kangol — @Brian, That’s a good point. It shows how uninventive, unintelligent, incompetent and hidebound he really is. None of those are good qualities in a President. Um yeah. But Fox News is a conservative echo chamber and hers just watching it to populate his twitter hit list of anyone who might threaten his fragile ego. Good for Trump. Another non-issue. No, we should all be revolting! That jingle is a damned earworm! The man has no social graces what so ever and as I have mentioned in a previous post I suspect his television watching habits have more to do with keeping abreast of issues that affect his money and investments more than what might be pertinent to running the country. Can we pause and reflect for a moment about how you look making fun of President Trump’s TV habits? Who TF do you think cares(?) and, talk about trite, petty and gotta-find-something-to-do-with-my-time reporters, goddamn. 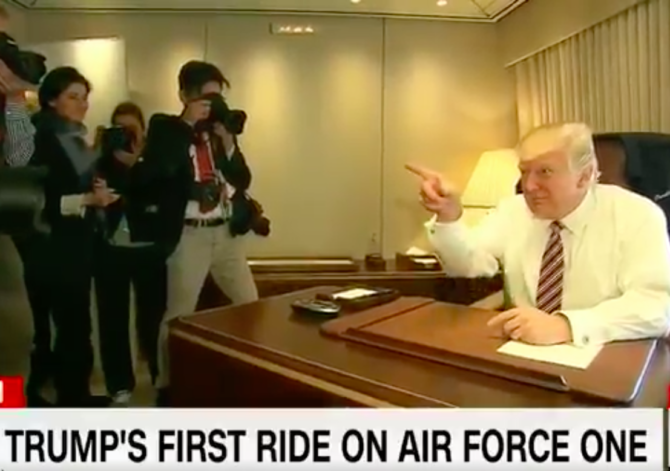 How DARE they report on his FIRST ride in Air Force 1?! I love the moniker given to him here; “Snowflake-in-chief”; absolutely appropriate for a man so freakishly thin-skinned and tone deaf. Let me start by saying I did not vote for Orange Twittler, but following the election, I was actually willing to give him a chance to go in and “shake up the establishment”. That was until our Intelligence communities outlined the history of Russian intervention in our democracy and government over the past several years, leading up to their direct involvement with this recent election. And then we get hit with the Trump subterfuge; let’s spin a ton of other things up so that all eyes are taken off that nugget of truth. That ended any feelings of acceptance for this guy; that came off the table. For as horrific as his actions have been this first week, I am gladly enjoying watching him and his administration implode on so many fronts. He has proved without a doubt, that he is incapably of governing to the people of this country, that he is incapable of accepting the truth or facts and learning from them, and that those close to him have absolutely no concept of what the heck he or they are doing. The saddest part is; he refuses to take responsibility for all of his failures in this first week; he and his staff denying and lying that anything was ever said or done that has to be undone. I want, so much, to see a full scale investigation in the Russian involvement in our US government; how far into our agencies did they infiltrate, and who knew what but decided to bury the facts instead of bring them to light, who was involved. Let’s talk about the TREASONOUS nature of those allegations and the implications it will have on elected officials, members of the administration and the RNC. Let’s get back to that and not worry so much about a Twitter war that the “Snowflake-in-chief” is having with [fill in the blank] or the photo-op he has set up to prove he is tremendously smaht. Implode away! You will be removed from office soon enough and all of those grand-stand “Look! I can sign my name!” photo-ops will be wiped out. Watch you TV 10 hours a day with your bag of Lays chips. I don’t really care because I will do everything that is in MY power to rise up and resist; I will support any and every effort to cast open the golden curtains on this clown and show him for the lying fraud that he is. To RIGay: Kudos to YOU for saying exactly what needs to be said here! Bravo! No need to worry, the executive orders are coming fast and furious. You guys will be crying for at least 4 years.